Smoking a pipe is an ancient way of relaxing, but one that still works; in our stressful society, half an hour of soulful pipe puffing will help you to slow down the tempo and bring on a contemplative view of life. 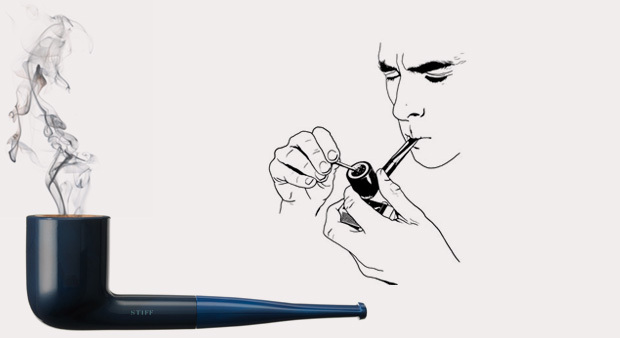 The Stiff pipe offers this age-old service but does so using 21st century technology in an exquisite design. Produced in Sweden, Stiff has developed the world’s first plastic pipe cast in one piece using polished thermo plastic equipped with a briar wood tobacco chamber. It is Stiff´s mixture of industrial know how and hand made techniques that make the Stiff pipe unique. The design allows for a better draught through the pipe, which – to put it simply – makes the pipe taste better. The Stiff pipe is an accessory; it’s part of a lifestyle. It doesn’t need hiding. Its subtle colour ways and glossy material means it’s made to be proud of. Pipe smoking is a guilty pleasure, one that isn’t necessarily good for you but brings a certain quality to life. It should be approached with a Dieter Rams-like ‘less, but better’ attitude, making sure that every drag counts. ’’ The question to ask is not whether an activity is riskfree, but whether the risk incurred are acceptable when weighted against the benefits. As with beauty, the acceptability of risk is in the eyes of the beholder.